We all visit the coffee houses which appear to always make the perfect cup of coffee. In many occasions, we wish we could do this at home but without spending the thousands of dollars on the equipment. What it takes is some insight of how almost everything can affect the taste of your coffee when you brew at home. All this and more you can learn from many places which offer barista courses. You can though get very close without this training as long as you follow a few simple procedures. To save you time searching for these, we have included them here. So now don your barista cap and get stuck into making a perfect cup of coffee at home. 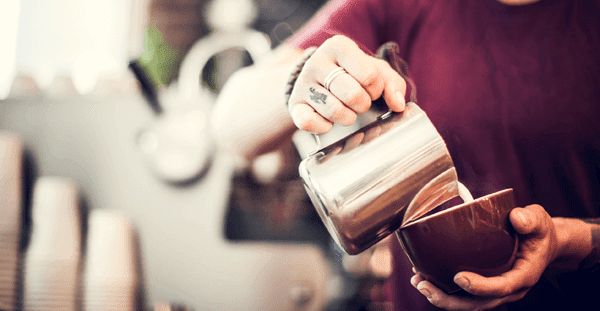 These methods are using a pour-over setup so invest in one before making heavenly cups. If you can find a local dealer who sells coffee beans all the better your cup will taste. On a pack, there will be a “best by” date. This isn’t the date you need to look for, the one you want is the roasting date. This should be preferably within the past 14 days (two weeks). You can find coffee grinders scattered around and even some blenders offer the capability. With these though you lack some or almost all of the control and consistency. Choose a manual burr grinder, or an electric burr grinder if you are looking at grinding a lot. There is a vast difference in price though. Burr grinders crush your fresh beans with a more even texture which gives more flavor. Here you should purchase a digital scale. If you are going to make the perfect cup, you need to know the exact amount of coffee and water. A good starting point is 25 grams of unground coffee beans and 350 grams of water per mug. This will be a good point where you can add or reduce coffee to your liking. This part is double-edged, you need good water and the right temperature. Purified water is the best choice so you have only one taste and the coffee won’t be influenced by water from the faucet. If you can’t purchase filtered. Boil a large jug and leave it ready in the refrigerator until you are ready to use it. Next is the water temperature. The ideal temperature is between 195 degrees and up to 205 degrees Fahrenheit. Water will boil at 212 degrees F, so once it has boiled, remove it from the heat and let it stand for 30 seconds. You should have your pour-over setup placed ready on your mug. Add a filter and rinse it with hot water. Get rid of this water and then set everything back on the scale. Now zero your scale and add your weighed coffee grounds. Now you should slowly add in a circular motion up to 50 grams of the water. If your coffee is as fresh as it should be, the grounds will puff up like it is taking in a large breath. Once you have added this water and the grounds, have begun to settle. Soak them again until you have reached the correct weight of water. For the entire process, it takes around two to three minutes for the water to seep and drip through your coffee grounds. This is where your taste comes into play. Take a sip and decide if it tastes bitter or bland. If there is a bitter taste, you should grind your beans a little coarser for your next cup rather than adding more or less coffee. If your cup tastes a little on the bland side, grind on a finer setting next time. All this affects how quick the water will run through the coffee grounds. Too large and the water runs faster, too fine and the water runs through slower and gives a stronger flavor. As these tips have shown you an exact amount of coffee to use, you will have beans ready for next time. These should be stored in a dark opaque glass jar or a ceramic container, and resist any temptation in placing it in the fridge or the freezer. Much can be said about the seal on the jar. If your jars are airtight, your beans will stay fresher for longer.